There is something to be said about draft beer. Every pour seems to be a unique experience, but, whatever it is everyone seems to agree that beer is better on tap. This is one of the many reasons why beer connoisseurs have developed at home tap solutions. One of these solutions is a beer tower, sometimes called a beer tube. These are tall tubular beer dispensers with a faucet that allows you to pour your own beer. 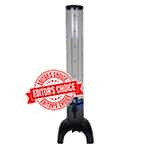 These dispensers are practical for parties and are convenient additions to a keg or kegerator. These beer tubes have a few different parts. 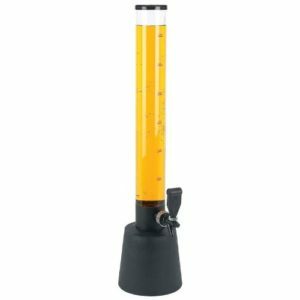 Beer is held in a plastic tube or jug and at the base is a spigot. The spigots are more of a faucet as they are meant to imitate an actual tap faucet. 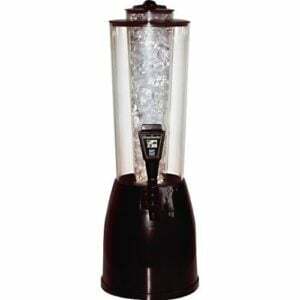 Some beer dispensing towers also have LED lights, and some may even have ice chambers. Whichever beer dispenser you may be interested in, they do a great job of providing convenience and can enhance a guest’s experience. 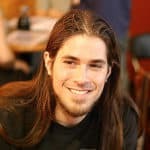 If you are interested in buying one yourself, take a look at some of the most popular models below. You may find that some towers may be a better fit for you than others. 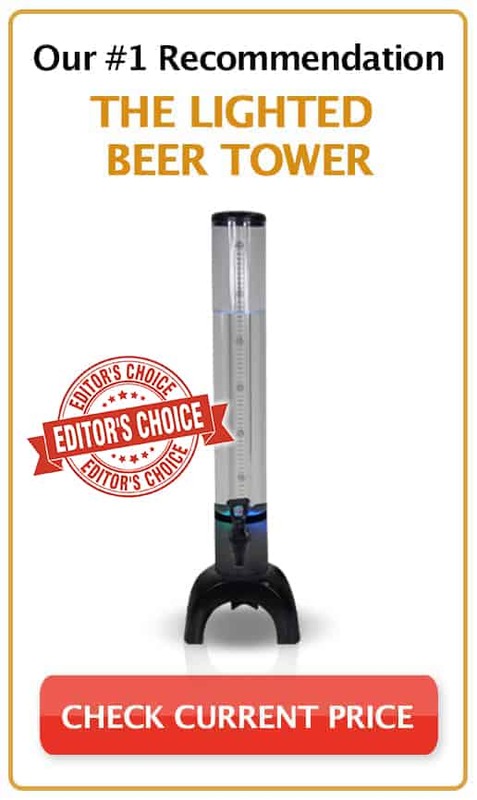 This tower combines the best features from other popular beer towers. It has a 101 oz capacity, LED lights, and an ice chamber. It is also still space friendly and can serve people from a table or counter-top. The addition of an ice chamber keeps your beer cold and makes the tube wider. The additional weight and wider design also give it a lower center of gravity than similar towers. 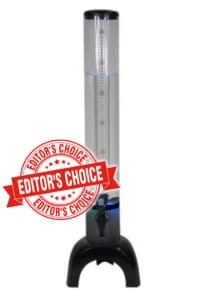 This beer tower by BarConic is also easy to clean, and the LED lights give a cool effect to whatever you are drinking. This is my recommendation to any friends or family that get into serving brew at home. Beer tubes like this should be a common household item. It not only dispenses beer, but it also helps keeps it cold too. The shape of this tower also makes the dispenser very table friendly. This beer dispenser holds 101 Oz and has an ice chamber, which acts as a beer tower cooler to keep drinks cold. Unlike many beer tubes, this one has a low center of gravity making it more stable and practical a table piece. Another cool feature of this beer tube is the LED lighting. When illuminated, it brings an extra pizazz to your brew. You may have seen beer towers similar to this one at a bar or two. It is perfect for serving brew at the table side or at a snack bar. This way your guests will be able to easily refill their drinks, and your friends won’t have to go back inside to the kegerator. 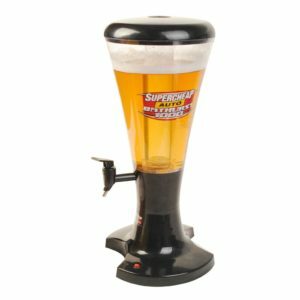 This tabletop beer dispenser does not take up any more table space than a standard pint glass, and it can hold more than nine beers. A spigot at the base makes it easy to pour, and the spigot is detachable for easy cleaning. It is also light so you can still easily move it when it is full. 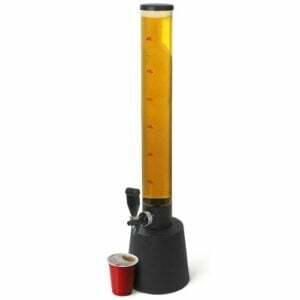 Beer towers like this make serving both easy and convenient. This beer tower is similar to the tabletop beer tower with LED lights. The drink container is wider rather than tall, and it has an ice chamber cooler in the center. This tower also features similar LED lights. The sleek design of the tube is very nice. There are no large logos, and the LED lights add a cool effect. The capacity at 80 Oz is not as high as some other tubes but its ice chamber is large, and it does a good job keeping your drinks cold. The Gulp beer tower is another popular beer tube style dispenser. It holds up to 118 Oz and makes serving extremely convenient. You can place this tower wherever is easy for your guests and you won’t need to worry about refilling their drinks. It is very easy to use. All you have to do is fill the tube and let your guests fill their cups from the faucet. It is also effortless to clean as its parts are made of plastic and can be easily taken apart. Ice chambers are an excellent addition to a beer tower dispenser. Nobody likes to drink a warm brew, and they do a pretty good job keeping things cooler for a while. However, I’m not entirely convinced they are always the best option. Beer tubes without an ice chamber are usually cheaper and can be less of a hassle. Ice chambers can take a lot of ice to fill, and large cubes may not fit well in some models. And in my experience, people tend to empty towers before they get too warm anyway. Learn more homebrewing tips by checking out our recommended homebrew kits and supplies. I recommend the Lighted Beer Tower. It is a solid beer tube that will always provide what you’re looking for: cold beer served in style. It is also very easy to fill from a keg or kegerator. This has been very convenient when my kegerator is in a different room or we are outside. It’s simply the best, in my opinion.